Held on one of the best dance floors in Charlotte, this bi-monthly drop-in event presents varied cultural themes. Mint to Move is not just a dance party; rather, it is an artistic and cultural experience paying tribute to artists and dance forms from Latin, African, and Caribbean countries. Adults enjoy four hours of Afro-House, Afro-Cuban, and Latin American dance rhythms with a DJ, live musicians, and unique themes to celebrate multi-cultures, ethnic and gender diversity, dance, visual and performing art. Samba, salsa, bachata, cha cha, line dance, and step to other dance forms relative to various global communities as well as enjoy other performing and visual art (i.e., live painting). Mint to Move offers discount admission before 9 PM and free dance lessons from 7:45 to 9 PM with Rumbao Dance Company. Ballroom, salsa, and other dance programs are welcome. Complimentary snacks and party favors are offered while they last, along with a cash bar. Community partners include Oneaka Dance Company, ArtSí, the Puerto Rican Society of Charlotte, Rumbao Latin Dance Company, Comité de Fiestas Patrias y Tradiciones de Charlotte, Líderes Colombianos en Charlotte, Soy Latino Como Tú, Latin American Chamber of Commerce, LGBT Chamber of Commerce, and the UNCC Department of Africana Studies. 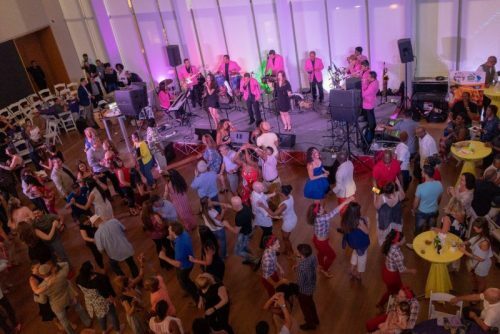 New to Mint to Move: Afro House dance lesson at 8:30 PM with Oneaka Dance Company and salsa and bachata lesson with Rumbao Latin Dance Company at 8:45 PM.